Due to a vacation to Tasmania (despite the current bushfires) and the fact that I forgot to bring my sleep monitor along, I will not be monitoring my progress using sleep graphs from Sunday night through until Thursday night. I will continue the experiment, despite this and hope that I am able to provide adequate documentation of my sleep habits. As reported on Sunday, I only took one sleep block of 4.5 hours and then my next sleep cycle was in the evening, and was supposed to be from 10pm until 2:30pm. I was using an unfamiliar mattress and did toss and turn a lot. I would guess my final sleep between 11:30pm to 12am. I then slept for about 4.5hrs and woke up at 4:30am, with a fixed alarm (that I changed at 3pm). I can't say that I had the most refreshing sleep, though I do feel rested. 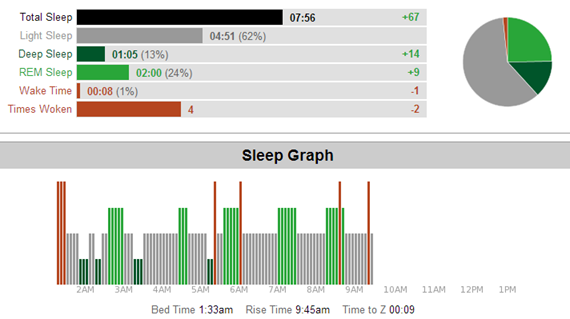 I was fairly effective in the morning, though I have not measured my productiveness (as I’m on holidays). I was definitely able to perform well enough to get to Sydney domestic airport and start my journey to Launceston without any issues. On the plane, I read for the first hour of my flight before tiredness kicked in at 11am. I became weary and had to force myself to stay awake for the remaining 30 minutes of the flight. I then had a 3 hour drive (fortunately I was driven), to Smithton where my vacation is taking place. As a notoriously bad car sleeper, I stayed awake through the trip and went straight to bed when we arrived. In the afternoon, I slept from 3pm until 4:45pm, woken by my alarm. This was one of the most vivid sleep experiences I’ve had during this study and also one of the most difficult to wake from. I have remained sluggish for the remains of the day (it is now 10:30pm) and aim to sleep for a 6hour cycle tonight. Attempting to reset my body-clock to the biphasic cycle. It is clear that after the weekend that I need to plan my sleep cycles more carefully if I am to stay on this study for more than 1 month. Although I have been tired all evening, I was able to achieve some very useful work. I have been redesigning the structure for Oolieyah in my mind, and this afternoon was able to make the foundations for the new architecture. There are two more components to this system that need to be created, and I think that if I am able to have a working system by tomorrow evening then it will be a testament to myself that I am not depriving myself to unsafe working levels. For the remainder of my trip I am planning the following sleep schedule, I am listing this now to assess how successful I have been at sticking to it over the coming days. Tuesday sleep 2pm, wake Tuesday 4pm (given 30min time to sleep). Following with awake period 8hrs. Wednesday sleep 12am, wake Wednesday 5am (30min time to sleep). Continue. Last night I went to bed at 11pm; however, did not sleep until 12:30am due to warm nightly air that kept me tossing and turning. I was able to reset my alarm clock at midnight for 6am, and did manage to wake with the alarm. I was sluggish in the morning but able to work on my holiday project without issue. I then took a tour across the North Western coast of Tasmania at around 9:30am, returning at 11:30pm. After lunch, I have napped from 1pm until 3pm. The after lunch nap today was one of the best naps I’ve had thanks to a constantly cool midday temperature. In addition, it has fuelled my holiday project work to about 10pm with occasional breaks. It has been almost a week on this new routine now, and my biggest problem currently is in working siestas into daily plans, which I think will become much easier when I figure out a rhythm that works well. Right now it is almost 11pm at night, and I’m happy to finalise my daily activities and sleep by about 11:30pm. I will be aiming for a 4am wake up in the morning. I slept better last night with a midnight doze off; I woke up at 5:30am after pressing sleep through my first alarm. I was mildly more productive today than other days and more in control of my sleep. I napped at 2:30pm and woke up at 4pm. At night, I was able to complete my holiday project to a point that I am happy with, meaning that the holiday portion was still productive, even with daily trips to see Tasmania. Terrible night of sleep, I went to bed at 12:30am; however, tossed and turned until 2am. I woke up at 6:30am to my alarm. Did not have much to do in terms of heavy thinking about work; however, could not focus on my book on the flight back to Sydney and reverted to watching in flight television. I attempted to rest at 2pm; however, was woken several times by my brother and gave up on sleeping at 5:30pm. Managed to get home to my place at around 11pm and went to bed at 2am. Due to the lack of sleep for the last day I reverted to a monophasic sleep cycle of 8hrs (shown below). So far today I have been very attentive and energetic. Will see how I go tonight with my overnight cycle coming up. Of interest in my monophasic sleep cycle, I noticed that I woke up at 5:30am, which has been my primary wake time all week in Tasmania. It is interesting to think that my sleep pattern has already begun to change.